Every day, if we take the time to look around, we can find something to be grateful for. There are days, however, when we do need to look a little harder than others. Think about it; we have roofs over our heads, food in the cupboards, family, friends, jobs, hobbies, freedom, faith, and so much more. We are so blessed, and yet too often take what we have for granted. It’s so easy to slip into complaining about what we don’t have, what we want more of, or that we wish for something different. In this particular season of my life, I’m “homeless”. But then I realize, that while I may be searching for a permanent address, I’m not homeless. I’ve been welcomed by family, I’ve been able to do some house sitting, and I have family helping me in my home search. I have a roof over my head, a bed to sleep on, food in the cupboards, my job, and most importantly my Bailey Boy travels with me. I call myself homeless until I see the person walking down the street with everything they own in a grocery cart. It’s in moments like these I realize how blessed I am, and I am grateful. It’s also in moments like these that I realize I need to get back to writing out a daily gratitude list. 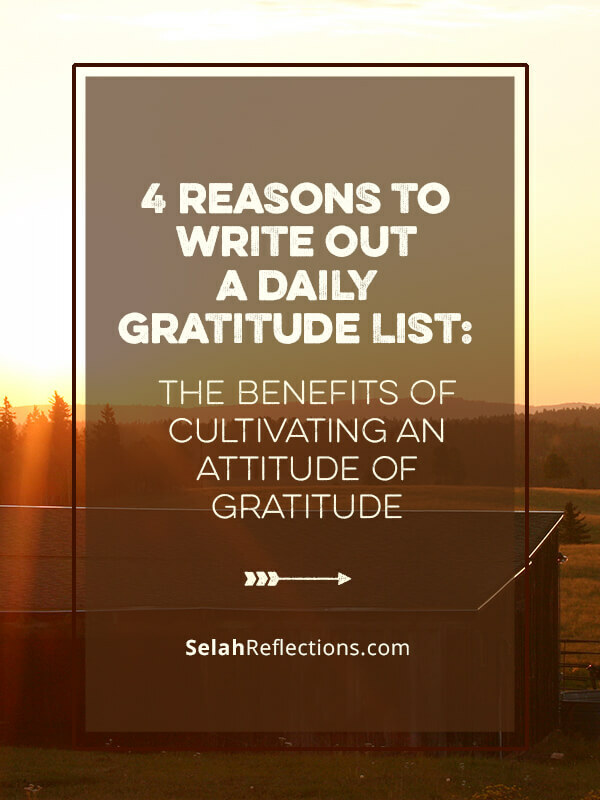 Over the years I have found that this simple act of daily writing out a short list of things I am grateful for, becomes a tool to help to not only cultivate an attitude of gratitude, but it also helps me look for and find things to be grateful for throughout the day. 1) We need reminders: We need these daily reminders of the gifts right in front of us. We get busy, skip over the good and zoom in on what’s not going right, or, we get so used to the good we take it for granted. My Bailey Boy is a gift; I have food to eat, a roof over my head, family and friends who love and care about me, and a Father in heaven who thankfully, is EXCEEDINGLY patient with me. When we get too busy, overwhelmed, and frustrated, these are the times we need to be reminded to stop, slow down, take a deep breath, and remember what we have to be grateful for. There are days it will be hard to come up with three things, other days we will be able to come up with 10. Even on the hard days, even if your list is only, I’m glad I have a bed to sleep in today and that I have a roof over my head, fine. Write it out, cultivate this habit. 2) It changes our perspective: Having a list written out that we can refer too, is also a gift. It can help shift our perspectives when we are having a bad day, and it feels like nothing is going right. We can go back to this list and remember all the good things that have happened in our life. This list can become a powerful tool to help move us from overwhelm as we see God’s faithfulness, and His gifts. You might even find yourself smiling as you remember the events that prompted you to write it out that day. Even on the bad days, make sure you take the time to write out a couple of things that you are grateful for. 3) It’s a sign of obedience: I Thessalonians 5:18a, “Give thanks in all circumstances”. We are told to rejoice in the midst of trials and to be thankful in every thing. There are days I would prefer to ignore this verse. There are days I have to ask God, what in the world do I have to be thankful for? These are the days I have to ask for help to obey and give thanks. These are the days I have to look hard to find a couple of things to add to my list. The amazing thing is that when I do make that list, the tightness in my chest lessons, I breathe a little easier, and the tension starts to ease. It may not last long but in that moment of obedience, I know I’m doing something right, and planting a seed that will grow if nurtured. 4) It opens your eyes: Once we make the decision to write out a daily list, our eyes are opened little by little as we train ourselves to look for small things and big things we can be grateful for. With practice, your eyes, heart, and mind are open to what is around you and all the amazing things you have to be grateful for. What we focus on becomes our reality. When we are overwhelmed, everything is a problem. When we are experiencing depression, everything is so hard. When we are exhausted everything is too loud, too fast, and too much. It’s much easier to stay in that negative frame of mind than choosing to be grateful. Expressing thanks is a choice. Having a choice does not make it easy. Having this choice does not mean we have a magic pill that solves everything. Having a choice doesn’t mean we can always do it on our own. 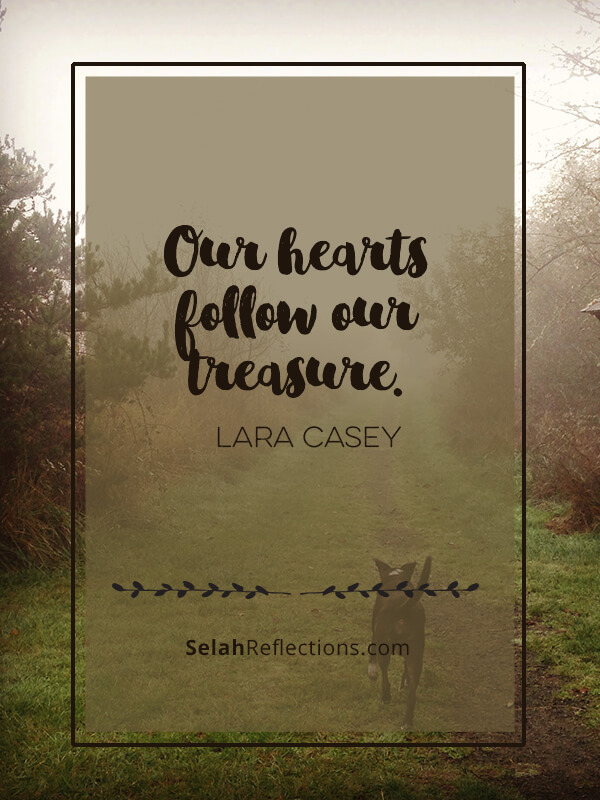 To help change our thoughts, sometimes we need a book like Ann Voskamp’s, One Thousand Gifts Devotional. Sometimes we need a friend to remind us what we have to be grateful for. Sometimes it is praying throughout the day, asking God to show us what we have to be grateful for because we cannot see it at that moment. You can understand why having a list to refer to can be important. Some days it will be easier, and we can fill an entire page of things we are grateful for. Joy filled days of little treasures we see and appreciate, take advantage of these days and fill a page to read and remember later. To help you (and me!) cultivate an attitude of gratitude I’ve created a downloadable for you to write out your own daily list of 5 things you are grateful for. Just click here to download. What’s on your gratitude list today? 1. Fam–so glad to be able to spend time with those in my home, and sometimes with those who live far away. I have to keep giving thanks for that, because the sadness of being far away from some family members can be so strong. 2. Friends. It’s so rewarding to spend time with friends close by, and to re-connect with the long-distance ones. 3. Health. I have many annoying health problems, but I am thankful for the ability to walk, talk, see, hear, taste, smell, do. I’m also thankful for the info available on the Internet (at least after weeding through the chaff to find the good stuff) for improving health in (mostly) natural ways. 4. Praise and prayer. God inhabits the praises of His people, He says in His Word. Praising Him re-wires my brain, and gives Him pleasure. Prayer from this perspective both grounds me and is effective, according to James 5:16. 5. Words. Words can be creative and powerful, or negative and destructive. I like the former. 6. Oceans, mountains, valleys, trees, flowers, sunshine, breezes, long shadows, and the sky. Thanks for another great reminder! You are welcome! It’s a daily habit worth cultivating for sure. Reminding us of how blessed we are.